Welcome to the Iowa State Fair Blue Ribbon Foundation’s blog! We are a non-profit organization with a mission to raise funds for the renovation and preservation of the historic Iowa State Fairgrounds. Since our inception in 1993, the Foundation has raised more than $150 million through individual contributions, state appropriations, in-kind services, and corporate, federal and state grants. Please follow our blog to learn more about our organization. I am currently working on entering the numerous donations we have received for the upcoming Corndog Kickoff taking place on July 13. We are working hard to get everything in order for the event, and we appreciate all the generous donations we have received so far! Please consider making a donation to the Corndog Kickoff Auction to help support Fairgrounds renovation projects. Donating an auction package consisting of your product or service is an excellent way to promote your company, as it will be seen - and bid on - by nearly 2,000 attendees. Some of the fun items we have received include gift cards to Fetch! Pet Care, a professional dog walking and pet-sitting service; a gift card to attend a painting class of your choice at El Arte Uncorked; and jewelry from DesignsBloom. Last week I was also given the chance to design an ad promoting the Corndog Kickoff for the Livestock Plus Inc. magazine. It was fun to be able to use my design skills as well as photos to create an ad that will be placed in a published magazine. Each day at the Blue Ribbon Foundation I am learning new skills and becoming more confident in my ability to take on new projects and use the talents I have to create professional work. I take my finals at Grand View University next week and will start at the Foundation full-time the following week! 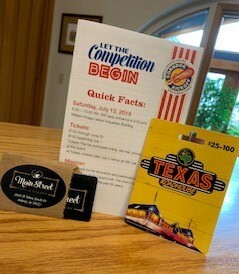 I am so excited to meet the rest of the summer interns and plan for a great State Fair! Check out the spring 2019 Newsletter. This issue features many upcoming events the Foundation has coming up, heartwarming stories of family and love for the Iowa State Fair and project updates happening on the fairgrounds. Be sure to mark your calendar for the Corndog Kickoff on Saturday, July 13 and the Iowa State Fair happening August 8-18. The newsletter also features a recap of the first-ever, “Halfway to the Fair Happy Hour Fundraiser” which took place in February of this year in the Elwell Family Food Center. Overall, the event raised $10,000 for future Fairgrounds renovations. 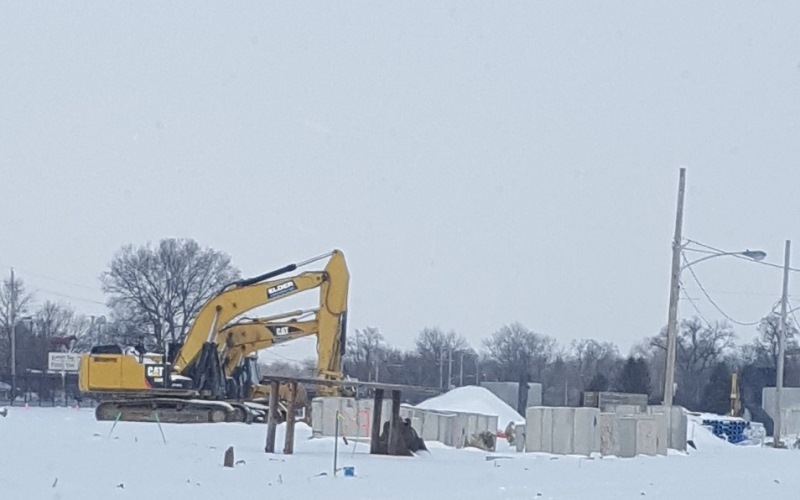 Thanks to the generous contributions from businesses and individuals that made this event possible and continue to support the Foundation in bettering the Fairgrounds. The 2009 newsletter featured a “You Asked” column allowing fairgoers to ask questions and get answers. This particular article featured the MidAmerican Energy Building which was just being built as a learning center about wind generation. 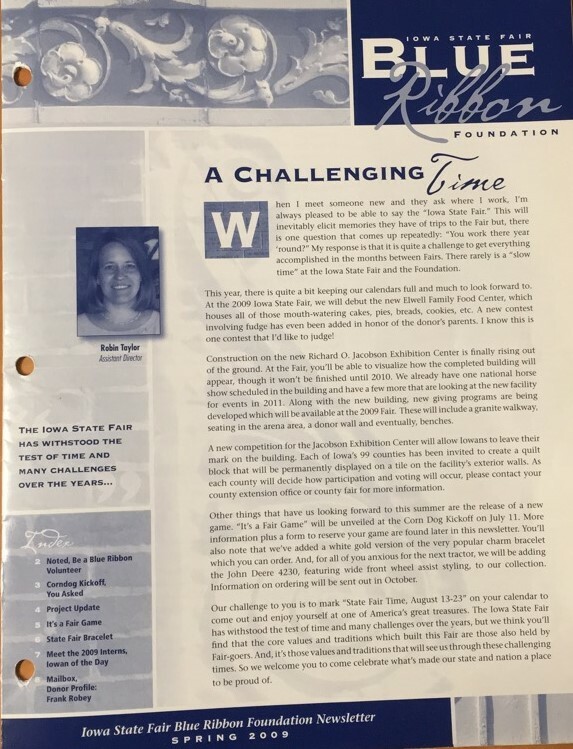 This issue also highlighted the “limited edition board game celebrating the Iowa State Fair.” This game allowed Iowa State Fair fans the chance to visit the Fair at any time and re-live the fun of trekking their way across the fairgrounds. This game is still available on the Foundation website. Frank Robey was chosen for the donor profile section of the newsletter in the spring of 2009. Robey was then a carpenter for the State Fair’s maintenance department. Robey is now the Assistant Director of Plant Operations for the Iowa State Fair. 20 years ago, thirty new trees were planted on the Fairgrounds, thanks to generous individuals who contributed to the Legacy Tree Program. The program was put into place to help replace many mature shade-bearing trees that were lost due to storm damage in 1998. “… I stumbled upon your fair by accident, but have loved it and returned every year since. I love everything about it; there is something there for everyone. Keep up the food work and the Iowa State Fair will live forever!” said Connie Ricklefs from Sterling, IL in the “From Our Mailbox”, section listed in the 1999 spring newsletter. 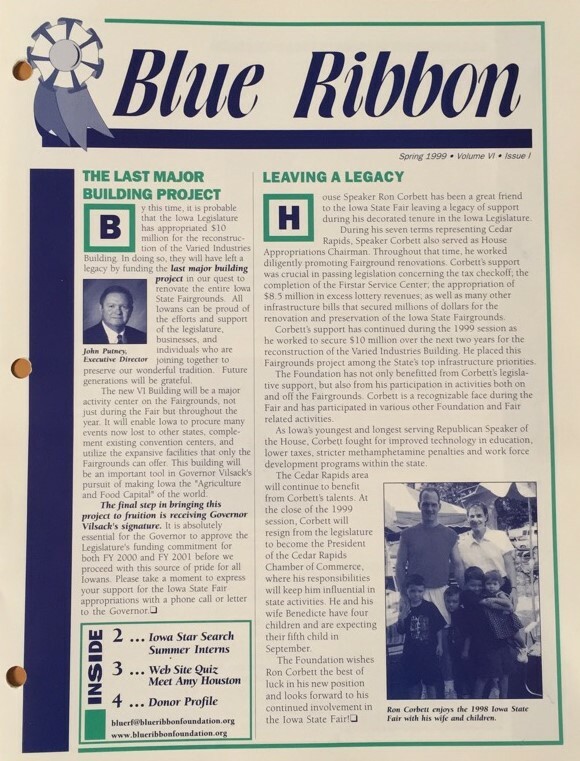 The newsletter featured Ron Corbett on his accomplishments during his ‘decorated tenure in the Iowa Legislature.’ Throughout that time, Corbett worked diligently promoting Fairground renovations and was crucial in passing legislation concerning the tax checkoff and many other bills that secured millions of dollars for the preservation of the Fairgrounds. 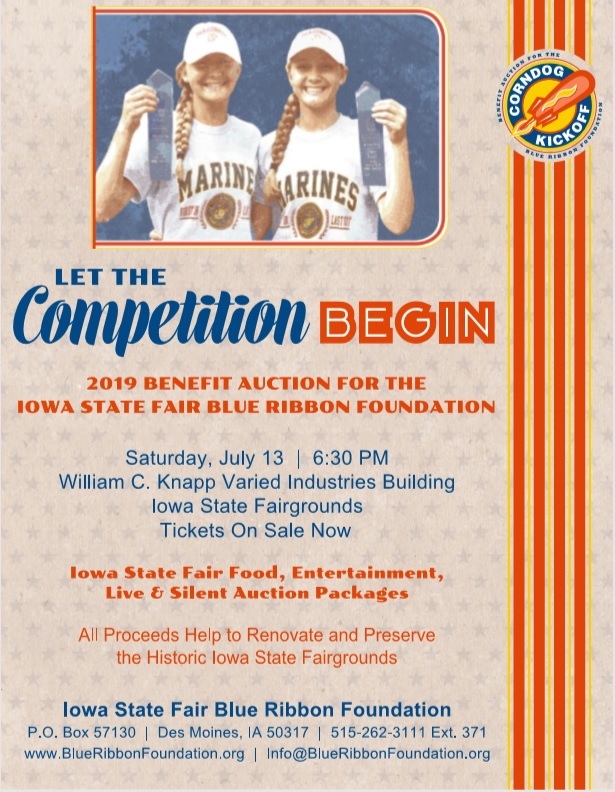 My name is Joy Van Wyngarden and I am very excited to be serving as the 2019 Sponsor Relations Intern with the Iowa State Fair Blue Ribbon Foundation. I am currently a junior at Iowa State University majoring in Agricultural Communications. I was born and raised on a row crop farm in the country near Pella, IA. My passion for agriculture and people started once I joined 4-H as a kid and further developed as I continued through high school. My interest in agriculture and working with people ultimately lead to my decision to attend Iowa State. On campus I stay busy with several club and extracurricular involvements. I serve as the Public Relations Officer for the Line Dancing Club, I’m an active member in ACT (Agricultural Communicators of Tomorrow), and I am a workshare member for the Good Earth Student Farm during the fall semester. Along with those activities, I am also a peer mentor for Agricultural Studies transfer students during the fall semester. For this positon, three other students and I help teach an orientation course to incoming transfer students. In my free time, I enjoy anything to do with the outdoors, hunting, traveling, cooking, and spending time with my friends and family. The Iowa State Fair, for me, is by far the best part about summer. The never-ending concerts, activities, and fried foods, make the fair fun and enjoyable year after year. I feel truly honored to be working with the Blue Ribbon Foundation this summer and will be counting down the days to the fantastic Iowa State Fair! It’s my second week on the job as the public relations intern, and I can’t believe how much I’ve already learned. The full-time staff give the interns a lot of responsibility and freedom to use our creativity, which in turn allows us to gain a lot of valuable experience. It makes me excited for what the rest of this school year and summer will bring! My first task on the job was to complete the donor profile for the spring newsletter. The profile will feature the Norman and Mary Van Zante family, who have contributed to the Blue Ribbon Foundation in many ways, including being members of Jake’s Club and longtime patrons of the Corndog Kickoff. This was a fun first assignment as I had the pleasure of chatting with Mary and hearing about their family’s history with the Fair. Look for their profile in the spring newsletter! Another project I have been working on is updating the contact list to promote the Iowan of the Day program, which will be my main job throughout the summer. I have also been looking into past winners and nominations. If you have nominated someone in the past and want to send more information on the individual, please email me at publicrelations@blueribbonfoundation.org. You can also nominate a new great Iowan by going to our website, http://blueribbonfoundation.org/iotd, and filling out a nomination form. Lastly, the Corndog Kickoff will be here before we know it! If you haven’t heard of this event, it is a fun-filled night complete with live entertainment, all of your Fair food favorites, and a variety of unique auction packages to satisfy all State Fair enthusiasts. The event will be held on July 13 this year, so mark your calendars and get your tickets here: http://blueribbonfoundation.org/events/corndog-kickoff/tickets. All of these projects will keep me very busy, and I am excited for the new experiences and seeing where this journey will lead me. 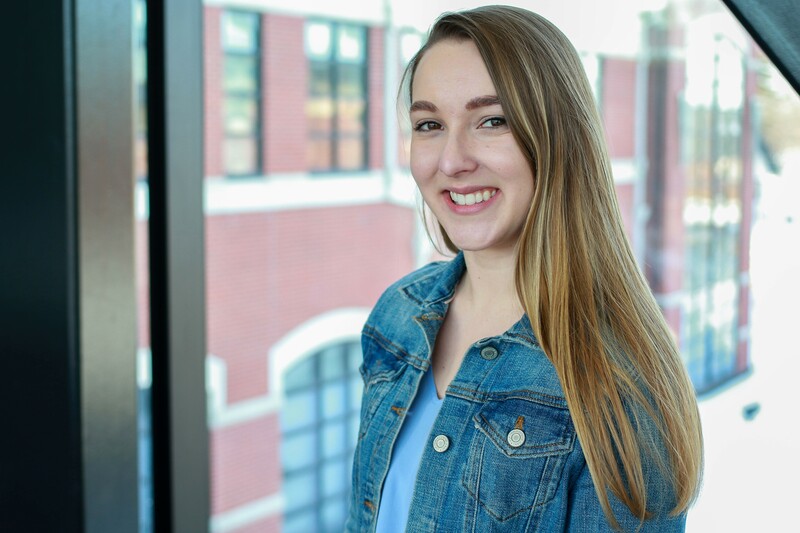 My name is Gabrielle Gerke and I am so excited to be serving as the 2019 Public Relations intern for this coming summer with the Iowa State Fair Blue Ribbon Foundation. I grew up in State Center, Iowa and come from a family with a long history of being involved with 4-H and the Iowa State Fair. I was a 4-H member growing up and participated in many different project areas, my favorite being communications and visual arts. My mother and grandparents were 4-H leaders and my grandparents were recently inducted into the 4-H Hall of Fame. I am looking forward to my continued involvement with the Iowa State Fair and seeing the fair from a different perspective as I coordinate the Iowan of the Day program. Currently, I am a junior at Grand View University double majoring in journalism/public relations and graphic journalism. Within my major, I am involved with GV’s campus magazine, Viewfinder, as an editor and am the social media coordinator for the Campus Ministry team. In addition to my major, I am involved with Team GV, giving tours to prospective students; work as a resident assistant, putting on campus events; and am a member of the GV dance team. In my free time, I enjoy spending time with my family, reading, playing with my dog, and exploring downtown Des Moines. As the Fair continues to get closer, I can almost taste the sweet, sugary taste of a lemonade and a steaming hot corndog as I watch the Bill Riley talent show; some of my favorite things about the Fair. Nothing compares to the Iowa State Fair! We’ve come so far but there’s more to improve. 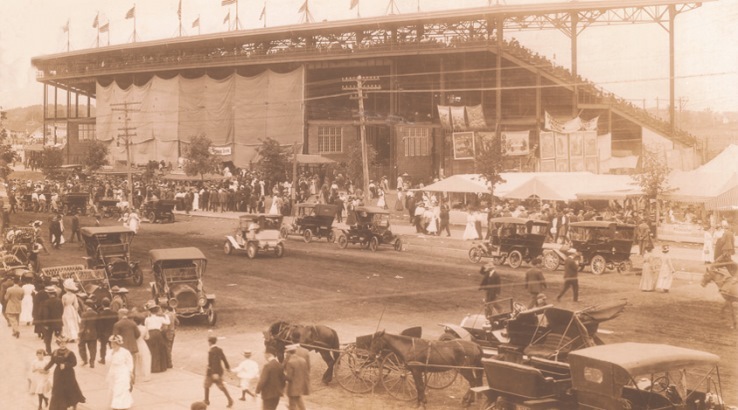 The Iowa State Fair Grandstand was originally built in 1909. Standing majestically just inside the main gate, the Grandstand is one of the most recognizable structures on the Fairgrounds. After several decades and millions of spectators, the building was in dire need of renovations. Concrete had begun to crumble, and the mortar between the bricks was chipping away. 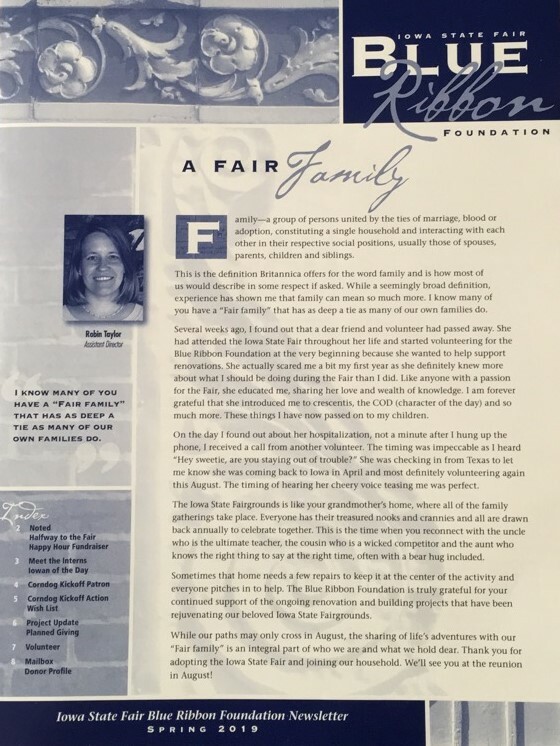 In 1997, supporters stepped up to help the Blue Ribbon Foundation raise funds to replace old seats, windows, doors, concrete flooring, brickwork, elevators and restrooms. In addition, handicap access and electrical wiring improvements were made. The Grandstand received another renovation in 2018 thanks to a generous $1 million donation from Kyle and Sharon Krause, and Kum & Go. The historic Grandstand structure remained intact, while adding 4,000 more floor seats, new restrooms facilities, and the newly named Kum & Go Stage. The new stage is much larger and safer with updated sound, lights and video screens. The Blue Ribbon Foundation also received a 2018 Prairie Meadow $600,000 Legacy Grant to support the expanded seating in the Grandstand now called Prairie Meadows Plaza. What's coming to the Grandstand in August? Check out the lineup. With your continued support, improvements will be made on other historic structures so future Fair-loving families can create their own memories exploring the Fairgrounds. Join our mission! Your generous gift will help the Blue Ribbon Foundation maintain the streets, sidewalks, and buildings - keeping the Iowa State Fairgrounds in top-notch condition throughout the year. History worth preserving. A future worth creating. The Iowa State Fair is the single largest event in the state of Iowa and one of the oldest and largest agricultural and industrial expositions in the country. 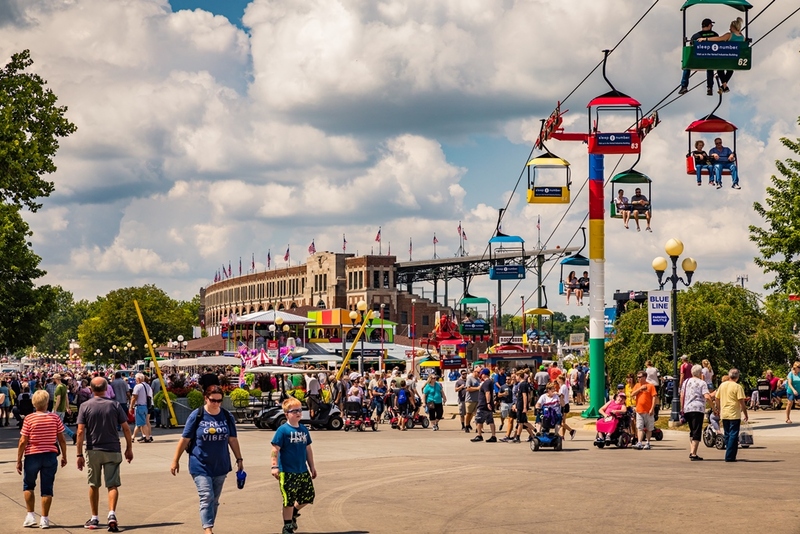 Annually attracting more than a million people from all over the world, the Iowa State Fair is a great celebration, a salute to the state’s best in agriculture, industry, entertainment and achievement. It is the true heartbeat of the Midwest, unequaled and unduplicated. Over the past 165 years the Iowa State Fair has grown, reflecting the development and growth of our great state. What will the next 165 years hold? You can help determine these future developments by supporting the Blue Ribbon Foundation’s mission to improve the Iowa State Fairgrounds. Work is still needed on many buildings as we look forward to what the future will bring. Join the Blue Ribbon Foundation and the growing base of donors in our charge to renovate and preserve the historic Iowa State Fairgrounds. A gift of $25, $50, or $100 will secure Iowa State Fair family traditions for the next generation. Donate here. Nothing compares to Iowa State Fair entertainment – especially the music. Right now, there is a lot of music buzz around the Fairgrounds. 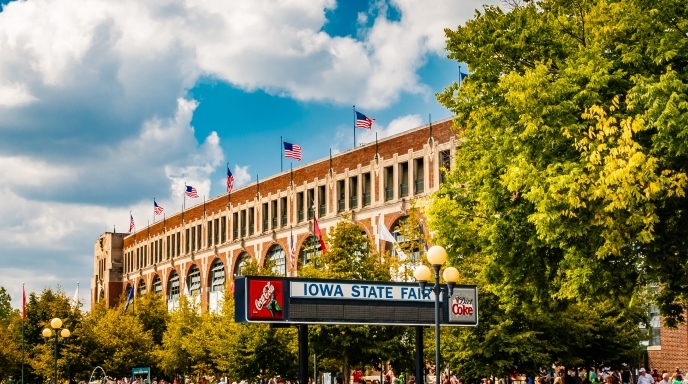 The Iowa State Fair has announced 9 of the 11 Grandstand Concerts for the 2019 Iowa State Fair, August 8 - 18. The Blue Ribbon Foundation is proud to have helped update the Grandstand layout in 2018. Once again in August, Fair fans will enjoy renovations including 4,000 more seats, new restrooms, and the Kum & Go stage. Last summer, the total Grandstand attendance hit a new record of 89,558 over the 11-day concert series. Who thinks we will break that record in 2019? The Iowa State Fair is also excited to provide an opportunity for Iowa talent to perform in front of audiences of all sizes. A Fair favorite - the free stage entertainment keeps Fairgoers coming back year after year. Applications are available online for you to perform on one of the Iowa State Fair stages. 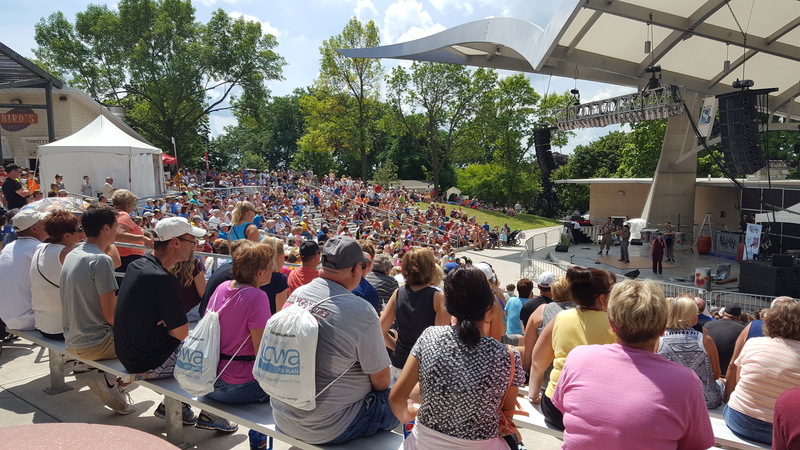 Whether you prefer the Susan Knapp Amphitheater, Anne & Bill Riley Stage or MidAmerican Energy Stage – there is something for every music lover. What’s music to the Blue Ribbon Foundation’s ears? “I’d like to make a donation!” Thank you to the Blue Ribbon Foundation donors that support our work. The Iowa State Fair would not be able to maintain the historic buildings or stages without Iowans across the state stepping up to support the Iowa State Fairgrounds. If you love the Iowa State Fair, consider making a donation to one of the giving programs or membership programs. Tribute gifts can be made in honor of a friend, to commemorate an important holiday or event, or made in memory of loved ones. The Blue Ribbon Foundation also manages the merchandise sold in the State Fair Store. Profits from the store directly benefit the Foundation's goal of raising funds to help preserve and improve the Iowa State Fairgrounds. Thank you for helping the Blue Ribbon Foundation continue to renovate and preserve the Iowa State Fairgrounds. Through the Corndog Checkoff, Iowa taxpayers can donate to support future projects on their state tax forms. The funding improves the Iowa State Fairgrounds that are used 365 days of the year – with our favorite 11 days in August. What kind of projects does a donation to the Blue Ribbon Foundation help support? Agricultural education is a highlight at the Iowa State Fair. From baby animals to food production, when visiting the Fair you will find plenty of exciting activities to learn about Iowa’s important agriculture industry. 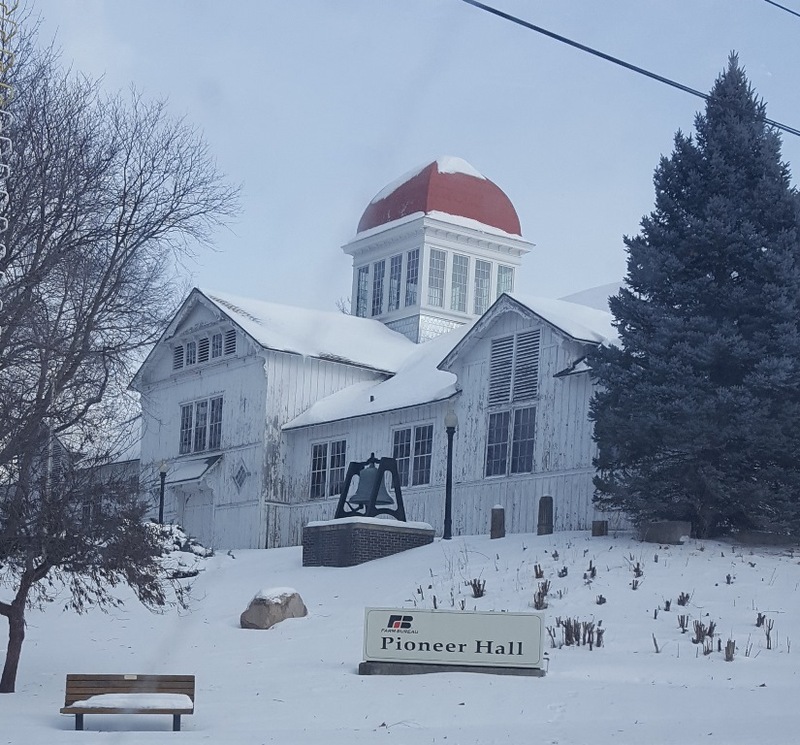 The world famous Butter Cow’s home in the Agriculture Building is just one historic structure that makes the Fairgrounds stand out. 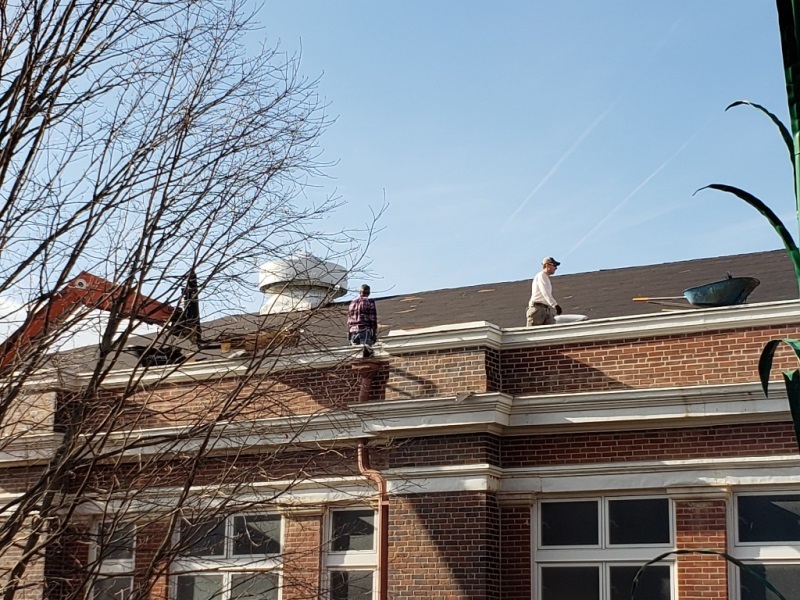 Last fall, crews repaired part of the building's roof. Continuing maintenance keeps the building in top notch condition. Last summer, the city of Des Moines replaced the storm water sewer along East 31st street. Since that project is now complete - a new concrete street, sidewalks and landscaping will be added to improve the flow of traffic north of Grand Avenue. This is similar to what was completed south of Grand Avenue, along East 31st street in front of the Elwell Family Food Center last summer. There will be a new pedestrian Admissions Gate that will be similar to the Admission Gate at East 33rd street. Overall, this area will be cleaned up with an organized layout to allow for future opportunities. Pioneer Hall was built in 1886 for the first Iowa State Fair at its permanent location. Of the 67 buildings constructed for that Fair, only Pioneer Hall remains. It was originally a poultry building, then an employees’ dormitory and a storage facility. Today it is a museum of Iowa agriculture that illustrates an important period in Iowa history. It’s also the site for the Fair’s Rural Americana Olde Tyme contests including cow chip throwing. This spring the north corner of Pioneer Hall will receive window and paint updates. Routine maintenance is done on the historic structure to keep it functional. Please remember when completing your taxes, to check off $1 (or more!) on your Iowa tax return and support the Corndog Checkoff.